Modern Weave is a continued exploration of reinterpreting a traditional technique (weaving) in a modern way. The original exploration was entered in and won the Eames Good Design Challenge and was then auctioned off to raise money for the Ronald McDonald House Charities. Our big idea was to “upholster” a chair in a different way while providing comfort & pattern through a richness of materials. With such an iconic chair, our goal was not to f*ck it up. We investigated this concept on several chairs to find the appropriate pattern, hole diameter, weave material/size, and how those translated to the added comfort of the chair. The original exploration (the white chair, 1.0) featured 0.25” diameter felt cord woven in a simplified ‘wicker’ pattern that flowed from the top of the backrest to the front edge of the seat. As a first finished piece, it achieved the goal of elevated comfort while maintaining the structure, form and aesthetic of the iconic chair. 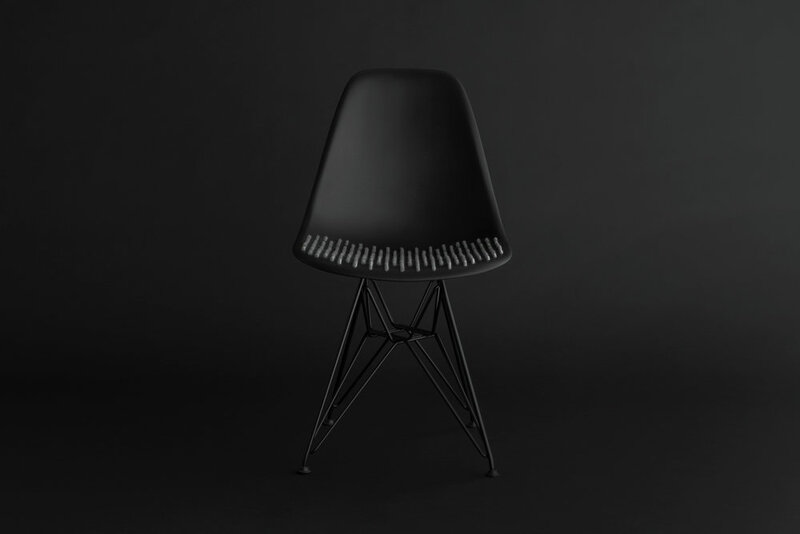 This is the chair that won the Eames Good Design Challenge. We are still continuing to explore and further simplify the technique and improve comfort. Understanding the seat as the primary area of interaction and where upholstery is traditionally found on chairs of this nature, we set out to refine the pattern and reduce the amount of material removed/added (the black chair, 2.0). This challenge led to us creating a pattern that was minimal and comfortable. The result is a refined ‘linear’ pattern that creates an elegant visual from every angle of the chair...even the bottom.